Ian Stephen is a Scottish writer, artist and storyteller from the Isle of Lewis in the Outer Hebrides. He fell in love with boats and sailing as a boy, pairing his passion with a deep interest in the culture of the beautiful but merciless Scottish coast. The following extract is taken from Stephen's new book Waypoints, in which adventure, memoir and storytelling combine to form a beautifully written account of voyages from Scotland's west coast. The book, which features illustrations by Christine Morrison, reveals a lifetime's passion for sailing, with each journey honouring a seagoing vessel, and each adventure accompanied by a stirring retelling of a traditional tale about the sea. Find out more on the Bloomsbury website. Even though I grew up on an island, that did not stop me hankering to set foot on other, outlying islands. When the tides swelled high, they also fell low. Then you could risk walking out to green places that had seemed impossible to reach. I read a lot when I was young and could also enter other territories that way. I was not sure if I was exploring the ‘real’ world or a landscape in a story. Sometimes we cut it fine when we crossed to outcrops of rock that would be cut off by a rising tide. A couple of times our small gang had to wade back, carrying shorts and shoes. It was like being in Kidnapped. David Balfour thought the natives were cruel when they rowed past him, ‘stranded’ on the tidal island of Erraid. He did not realise he just had to wait for the sea to fall then walk the breadth of the white sands to reach the shore of Mull. The author, Robert Louis Stevenson, knew that geography well. He stayed on Erraid with his engineer father to observe the granite being quarried for the great offshore lighthouses of Skerryvore and Dubh Artach. Ralph, Jack and Peterkin, however, could not walk ashore from the coral island on which they were stranded, though they did have a sure sense of their own moral superiority on their side, thanks to their creator, RM Ballantyne. That writer never did set foot on a like landmass, jutting up from the South Pacific. He borrowed and mixed in other, more informed, narratives. Even now it’s difficult enough to distinguish between accounts of charted islands and imagined ones. There are plenty of stories of islands that are sometime there and sometimes not. There was a bronze one that could appear from a wine-dark Aegean Sea. That one drifted. There was one which might be found out to the west of Ireland. It would be nearly impossible to leave the charms of that place. Even if you succeeded, you would turn to dust if a foot were ever to hit on the mainland again. Growing up in Stornoway, you heard plenty of stories of islands out in the ocean. You could not separate the tales of the islands of the birdmen – people who were more at home on cliffs than on the sea – from those in myths. My next-door neighbour was born on St Kilda, 40 sea miles west of our island group. Not one person lived out there now but others in our street had relatives who steamed out, 40 miles north of Lewis, each year to Sula Sgeir. These hunters still brought home their salted gannets. We all had a taste of one my mother boiled outside our house on a camping primus. It was stronger than kippers and I found these salty enough. But I wanted to know how the men lived for the weeks they would be abandoned out on bare rock in the Atlantic, until the Ness boat came back for them and their catch. Even then, I could see that the most beautiful islands of all were difficult to reach. You caught glimpses of them, lying out from the ‘Long Island’ of Lewis and Harris, in the chain of the Outer Hebrides. We could drive to the long sands across from them, in my father’s Austin A-40. This was a forerunner of the hatchback family car and I got to ride in the boot, with its vinyl cover removed. We looked out from the stone jetty on the Valtos peninsula to Pabbay Mor. It seemed to be very fertile. A couple of wide, tarry boats were usually there, drawn up high above the tideline. These would take sheep as well as people back and fore. 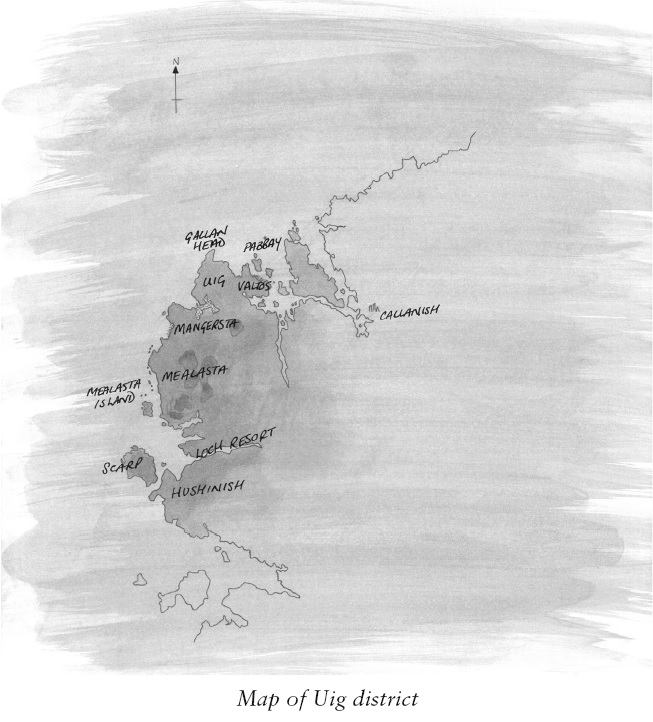 A cow might swim Map of Uig district behind a boat, towed on its tether across the Sound. There were rumours of lagoons but we did not know anyone who could lend us a rowing boat. None of us were very strong swimmers and my father was jittery at the thought of getting in any boat. The Loch Seaforth took you to the proper mainland at Kyle of Lochalsh. She was all right on a good night. I remember my father looking very nervous when the car he’d bought new was swung in nets from a derrick. My mother was always in a good mood because someone else was doing the cooking in the ship’s cafeteria. When we drove once to the very end of the Uig road, you saw another group of broad boats. Out there was the island of Mealasta, which had been abandoned for some years, though the shepherds still crossed to it to do their seasonal tasks. The island of Scarp, visible a few miles to the south, still had its houses and its school, though the post office was on mainland Harris. These village boats all had their purposes, mainly for transporting people and animals to and fro but also in setting creels or nets or lines for subsistence fishing. It’s not that island people didn’t enjoy being in and around boats when I was young. But they were there for definite reasons. Although I grew up in a harbour town, very few of my pals or relatives had the use of a leisure craft to take you across to the places you could not otherwise reach. When I joined the coastguard service I received proper training in the ways of tides, weather, seamanship, cliff and shore rescue techniques and the handling of power-driven craft. I gained the confidence to take Broad Bay further out from Stornoway. We could have invested in a road-trailer to take her over to explore the west side of the island but I was anxious about the stress to the old boat associated with launching and recovering. Some of my colleagues wanted to club together to buy an inflatable with a powerful outboard for the very purpose of visiting outlying islands. I was reluctant, not just because I had been warned about the pitfalls of sharing a boat and the issues of its maintenance but because already I had gained a sense that the relationship with the craft was part of the experience. Barbara, now my wife, had done more dinghy sailing than I had. We were given a Mirror dinghy that needed a bit of work but came complete with a sturdy trailer. Our VW van had a towbar already fitted by a coastguard mate, so we could tow our sailing craft to suitable launching places. I compiled a list of island slipways on a coastguard watch and examined many of them at low water, when you found holes and slime and other hazards, which narrowed down the possibilities. But the slip by Valtos pier remained on the list and so did the one at the very end of the road in south-west Lewis. No track has ever joined the Uig district to the township at the end of the snaking road that bounces round the hairpin bends through the grey and bare rocks of North Harris. Despite this, the communities kept in touch because transport was easier by sea than by road, until recently. Now, in the late 20th century, we had to launch our own boat to reach these abandoned islands. Its light plywood skin, joined with fibreglassed tape to its sides, was designed to make watertight buoyancy chambers. If these leaked, the dinghy was not safe. A housing for a ‘daggerboard’ that would resist sideways drift was also reinforced with tape around the boat’s bottom centreline. These are notorious for leaking. Mirror dinghies were so called because they were made popular, sold in kit form, by that newspaper. No specialist skills were needed but you had to be careful with the new chemistry of mixing resin. This would result in a rigid glass-fibre join, assisted by measured drops of catalyst. Sailing clubs often used them as trainer boats. More than 70,000 were built. They could become competitive, with ball-bearing blocks and bright, light, low-stretch cordage to tune crisp, red sails. Vestiges of spinnaker gear could be found on this one. However, we wanted to make a solid cruising dinghy that could survive beaching on rough sand and the inevitable bumps on the trailer. Our elder son, Sean, became involved in the gluing and screwing of reinforcing slats of timber and solid new fittings.